The Panasonic Lumix DMC-FX500 (announced 18 March 2008) is a 10.1 megapixel slim and compact point and shoot digital camera with an ultra wide 5x times optical zoom lens from Leica (25mm – 125mm equivalent) and a 3.0 inch LCD with touch screen interface. The Lumix DMC-FX500 is the first Panasonic to feature a touch screen interface which can be used using either the stylus pen that comes with the FX500 or your finger tip. The Panasonic Lumix DMC-FX500 also features Face Detection, Digital Red Eye Correction, plus a range of Intelligent Auto technologies such as Intelligent Scene Selector, Intelligent ISO which sets the ISO automatically according to the conditions and Intelligent Scene Selector. The Lumix FX500 also includes the ability to take1280 x 720p HD video content and still photos with a 16:9 aspect ratio, perfect for viewing on an HDTV. The Panasonic LUMIX DMC-FX500 will be available in black and silver models for a manufacturer’s suggested retail price of $399.95 in May 2008. SECAUCUS, NJ (March 18, 2008) – Panasonic today announces the LUMIX DMC-FX500, the company’s first digital camera with a 3-inch touch-screen LCD – also featuring a 25mm ultra-wide-angle Leica DC lens, 5x optical zoom and 10.1 megapixels. With a dual control system using both touch-screen and joystick operation, the ability to record High Definition (HD) video and advanced Intelligent Auto technologies, the FX500 packs innovative features and intuitive design, helping consumers enrich the digital photography experience and take better photos. The FX500 has a hybrid control system that combines joystick control with touch-screen operation, so users can make fine adjustments by touch, using their finger, or the LUMIX stylus-pen that comes with the FX500. In manual exposure mode, adjustments can be made using the on-screen sliders to adjust aperture and shutter speeds. 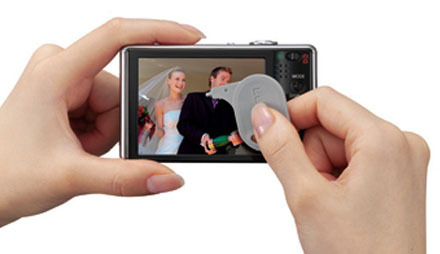 Users can also set the auto focus and exposure in frames by simply touching the subject, on while recording. In playback mode, a new Easy Organization menu allows for photos to be selected and viewed by scrolling through the thumbnails located below the main window. Then, users can edit the titles using an on-screen keyboard. The FX500 expands Panasonic’s family of wide-angle LUMIX digital cameras and joins the Panasonic LUMIX DMC-FX35 as an ultra-wide-angle lens with a 25mm wide-angle lens, which can capture almost double the photo area at the same shooting distance compared with a conventional 35mm lens*. Also new to the FX500 is Auto Focus (AF) tracking, a feature that tracks the photo subject even if it moves after the AF is set – especially helpful for catching active children or pets. Panasonic’s iA (Intelligent Auto) mode is an advanced system of technologies that engage automatically, so the user does not have to change any settings. Maximizing the iA mode, users can go a step further and easily set auto focus and exposure by simply touching the screen. This kind of quick, easy operation is made possible with the touch-screen technology. • Intelligent Exposure – To help correct photos from being under- or over-exposed, the FX500 instantly analyzes the framed image and adjusts the brightness in areas that are too dark because of dim lighting, backlighting or the use of the flash. • Digital Red-eye Correction– Helps eliminate the red-eye problem that sometimes results when taking flash shots at the night. Incorporated into the built-in flash, the camera emits a small preliminary flash before the main flash, detects red-eye and digitally corrects it. • MEGA O.I.S. – Gyrosensors detect hand-shake and the lens system shifts to compensate, helping to prevent hand-shake from creating a blurry image. • Intelligent ISO – Determines if the photo subject is moving and changes the ISO setting and shutter speed accordingly. • Intelligent Scene Selector – Senses the ambient conditions, recognizes the shooting environment and automatically selects the appropriate scene mode from: Scenery, Portrait, Macro, Night Portrait or Night Scenery mode. • Face Detection – Detects faces anywhere in the frame and automatically chooses the optimal focus and exposure settings so portraits come out clear and crisp. Detecting up to 15 faces, Panasonic’s Face Detection can even track a face if the subject is moving. • Continuous AF – Maintains focus on the subject even without the user pressing a shutter button halfway, thus minimizing the AF time. Other features include its ability to take1280 x 720p HD video content and still photos with a 16:9 aspect ratio, perfect for viewing on an HDTV. In addition, the FX500 incorporates the Venus Engine IV processor, featuring more advanced digital signal processing technology for taking even higher-quality images. The fdsa proprietary Venus Engine IV also heightens the detection accuracy and corrective features in both MEGA O.I.S. and Intelligent ISO Control. This entry was posted in Digital Cameras, Panasonic and tagged Panasonic, Panasonic Lumix on March 19, 2008 by jonathanb.